Learn how to use microcontrollers without all the frills and math. This book uses a practical approach to show you how to develop embedded systems with 8 bit PIC microcontrollers using the XC8 compiler. It's your complete guide to understanding modern PIC microcontrollers. Are you tired of copying and pasting code into your embedded projects? Do you want to write your own code from scratch for microcontrollers and understand what your code is doing? Do you want to move beyond the Arduino? 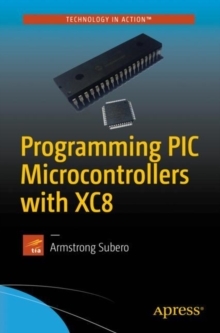 Then Programming PIC Microcontrollers with XC8 is for you! Written for those who want more than an Arduino, but less than the more complex microcontrollers on the market, PIC microcontrollers are the next logical step in your journey. You'll also see the advantage that MPLAB X offers by running on Windows, MAC and Linux environments. You don't need to be a command line expert to work with PIC microcontrollers, so you can focus less on setting up your environment and more on your application. What You'll LearnSet up the MPLAB X and XC8 compilers for microcontroller developmentUse GPIO and PPSReview EUSART and Software UART communicationsUse the eXtreme Low Power (XLP) options of PIC microcontrollersExplore wireless communications with WiFi and BluetoothWho This Book Is ForThose with some basic electronic device and some electronic equipment and knowledge. This book assumes knowledge of the C programming language and basic knowledge of digital electronics though a basic overview is given for both. A complete newcomer can follow along, but this book is heavy on code, schematics and images and focuses less on the theoretical aspects of using microcontrollers. This book is also targeted to students wanting a practical overview of microcontrollers outside of the classroom.